A DOG'S LIFE believes just like people, your dog should enjoy a trip to the spa and not fear it! Our staff incorporates a gentle and tender loving care approach to our spa guests. 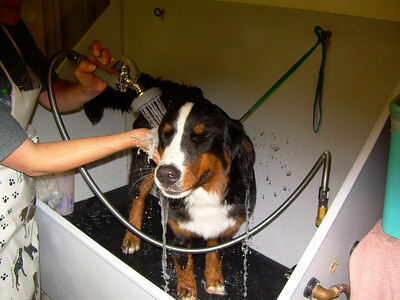 We take our time, make our doggies feel at ease, massage, pet and relax them so they do not fear trips to the groomer. Having a bonding session and a cookie or two before a nail trim or bath is not uncommon for our spa clients. We believe creating a positive and loving experience for your dog is as important as having a your pup look WONDERFUL! *NOTE: Price may increase depending on the condition of your dog's coat and/or temperament. Cancellation policy: We kindly request at least 24 hours notice for any cancellation or rescheduling of any spa services.